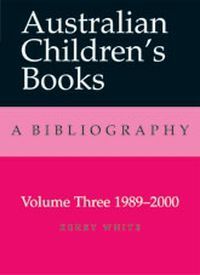 In addition to two volumes of Australian Children's Books: a Bibliography, Kerry White has compiled Australian Children's Fiction, the Subject Guide (Jacaranda Wiley, 1993 and 1996), is a major contributor to The Source, a web-based guide to children's books and poetry, and has written numerous conference and journal papers, newspaper articles and reviews on Australian writing. She is a graduate of the University of Wollongong; in 1985 completing a doctoral thesis on Australian family stories, the first Doctorate of Philosophy entirely about Australian children's books awarded by an Australian university. Dr White tutored and lectured in Australian literature and children's books until leaving teaching in 1989 to concentrate on bibliography and writing. She has been a judge for the Children's Book Council of Australia, a member of the judging panel for the 2001 NSW Premier's Literary awards and is on the board of the newly formed Poetry Australia Foundation. The award of a National Library of Australia fellowship in 2001 made possible the completion of this third volume of the Bibliography.